Characteristics: All ages have pink legs – a good field ID. From there it becomes more difficult as this gull doesn’t reach adult plumage until its fourth year. And, to add to the confusion, there are the breeding and non-breeding plumages (although not that much different). A good field bird book is needed if you want to be familiar with gulls. Glaucous-winged Gulls are large, ranging in size from 19 -23 inches, and weighing in at around 2.0-2.5 pounds, slightly larger than a Herring Gull, but slightly smaller than a Glaucous Gull. Adults: Look for a large, stocky gray/silver gull with gray back and gray/silver (not black) wingtips, with white spots near tip. Eyes are dark compared to light eyes on Herring and Glaucous Gulls. Their bill is yellow with some red on lower mandible and don’t forget the pink legs. Breeding birds have an all white head and neck, while non-breeding birds have mottled gray in the head and neck. They are commonly found in pairs year-round, but will forage alone or in large groups. Preferred Habitat: Look for the Glaucous-winged Gull near or on coastal water year-round. It prefers good food sources such as bays, inlets, estuaries, beaches, harbors, mud flats, and spends much of the winter loafing on offshore waters and beaches. 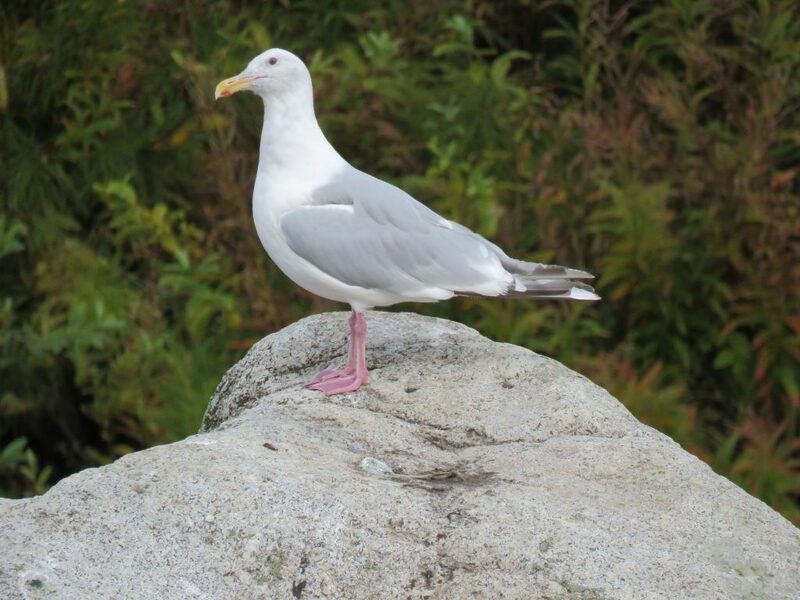 In the breeding season, this gull nests on steep coastal cliffs and rocky offshore islands (e.g., Gull Island). Breeding Season: Begins mid-May to early June, ending in August. Glaucous-winged Gulls do not begin breeding until their fourth year or later and breeds/nests in colonies, sometimes quite dense. 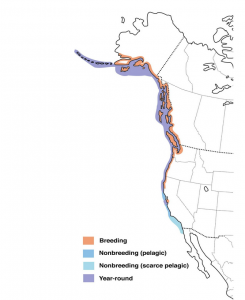 As a social breeder, it may breed/nest in colonies with other gull species or seabirds (e.g., puffins, murres). Nesting: Preference for a nest site is a nest on the ground, rock ledges, and cliffs, but they may nest on suitable buildings or structures. 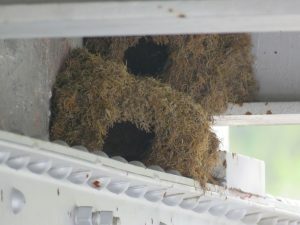 The pair will ‘nest bond’, generally starting several nests, but completing only one nest. The nest is a bulky cup shape consisting of grasses, seaweed, feathers, fish bones, and other debris (including plastic, unfortunately). 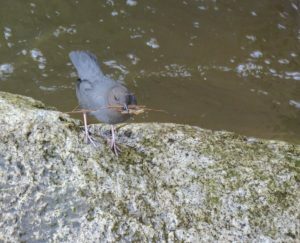 The use of plastic by birds is not a good use of “recycling plastic”since the plastic often be ingested or will entangle the nesting bird or chicks. Eggs and Incubation: Typically 2-3 eggs are incubated by both parents for 26-29 days. Hatchlings are semi-precocial (eyes and ears open, but cannot move about) and downy. The chicks are fed by both parents. 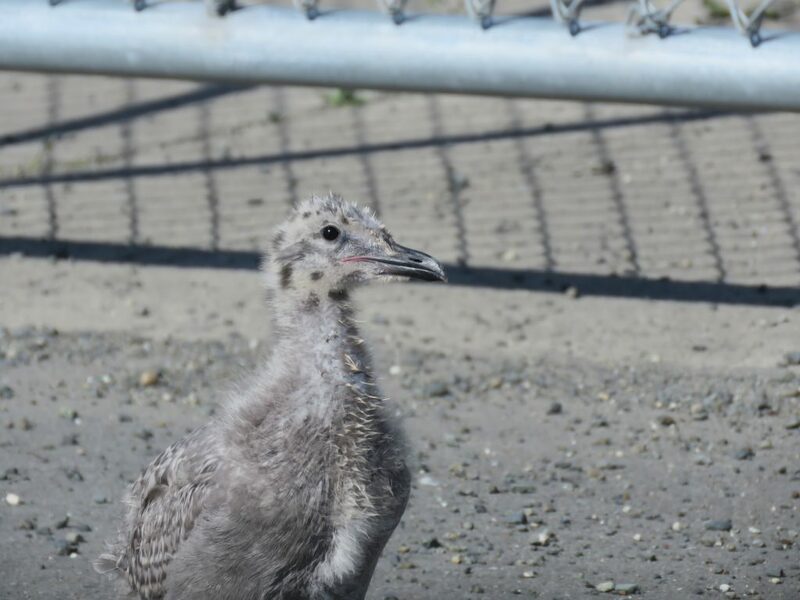 The chick’s coloring is cryptic to help camouflage it from predators, including other Glaucous-winged Gulls. 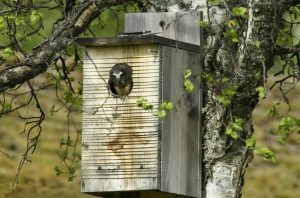 Fledging: The chicks generally fledge 35-54 days following hatching and will leave the colony about two weeks later to forage on their own. Food Preferences: Their primary food source is marine invertebrates (limpets, chitons, clams, mussels, squid, crab etc.) and fishes. 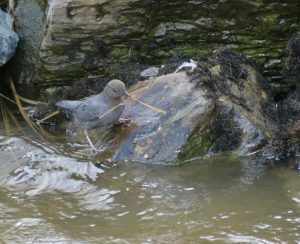 They will also predate seabird eggs and chicks. 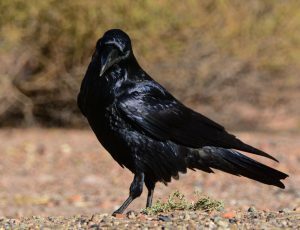 They scavenge carrion and will eat food found in landfills and parking lots. Unfortunately people feed gulls, which attracts a lot of gulls in a feeding frenzy. The gulls create a riot as they swoop in to grab the morsel. This human activity is not appropriate and illegal within the City of Homer. 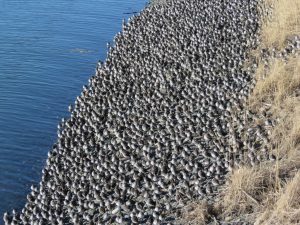 Gulls have a notorious reputation of hanging out, in large numbers and in mixed flocks, at landfills seeking food so many birders check out landfills to see if there are any rare gulls present. 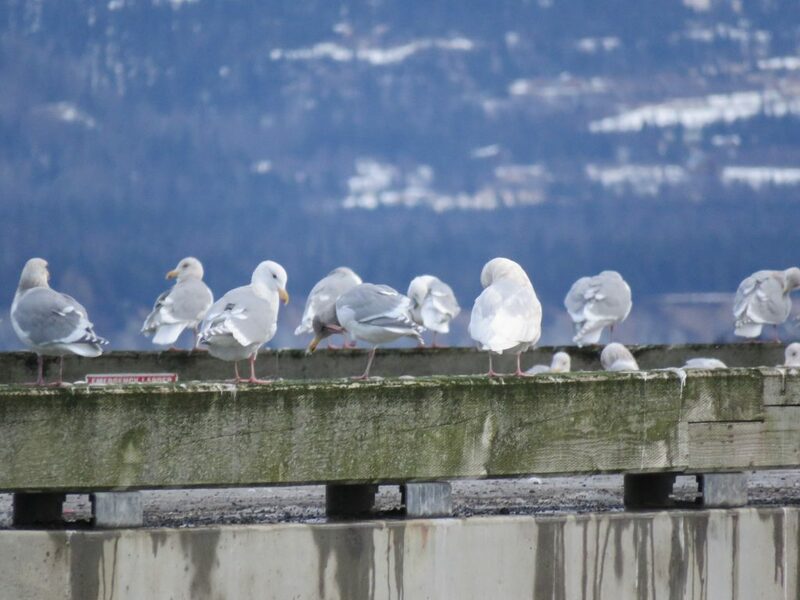 Feeding Methodology: These gulls forage at sea, in intertidal areas, along beaches, in parking lots and landfills. When on land they are ground foragers. They take prey from the surface of water or may perform a dramatic plunge into water from the air. They will try to harass and steal food from other birds, such as cormorants. Migration: Not all Glaucous-winged Gulls migrate as many northern birds are year-round residents, moving with the food resources. 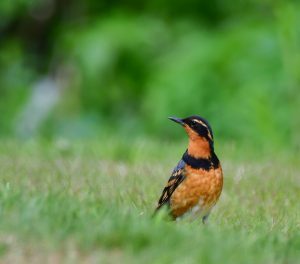 For those that do migrate, spring migration is from late February to early May. Fall migration is from late August to late November. 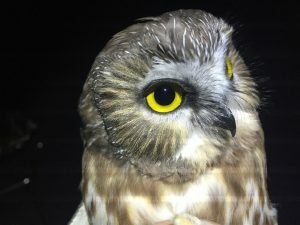 They may migrate as far south as northwestern Mexico but are rarely found inland, preferring a coastal environment. Vocalizations: This bird’s call is a “keow” whistle. If an intruder approaches you will here the ‘ga, ga’ notes. I think that is one we’ve all heard and is most familiar. 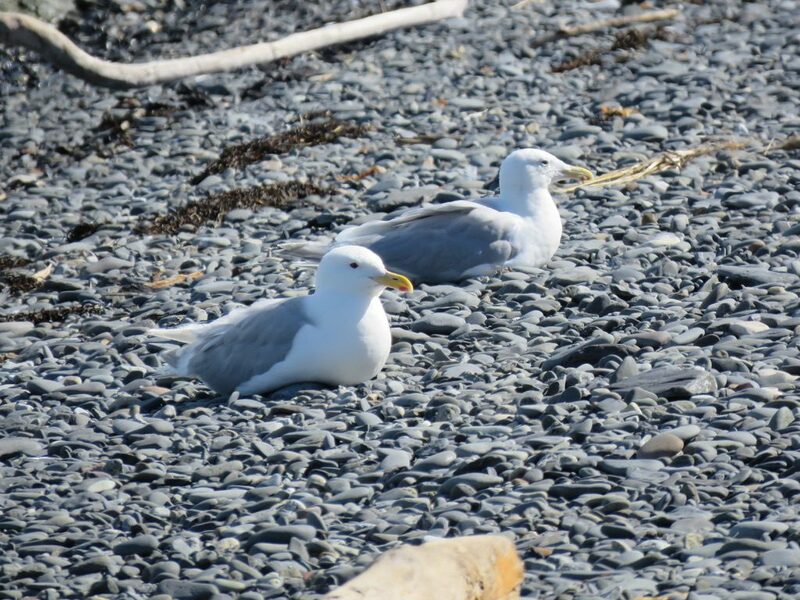 Threats: Fishing line and hooks are deadly as Glaucous-winged Gulls are opportunistic scavengers and can ingest a hook or get entangled. So if you see fishing line and hooks on the ground, pick them up and dispose of them properly. And if you are out fishing, do not discard these items onto the ground or from your fishing boat. Gull with fishing line and lure attached to it. 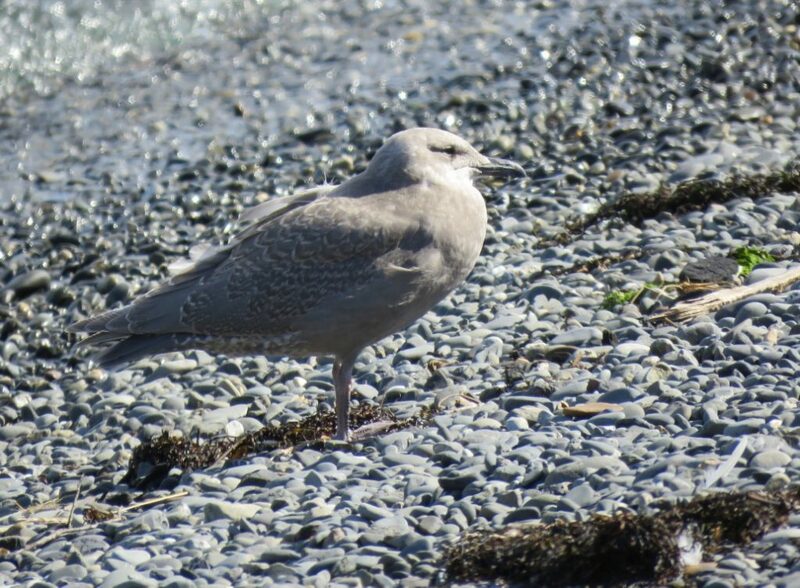 This bird hybridizes with the Herring Gull, Western Gull, and Glaucous Gull. The young may possess physical characteristics of both parents. 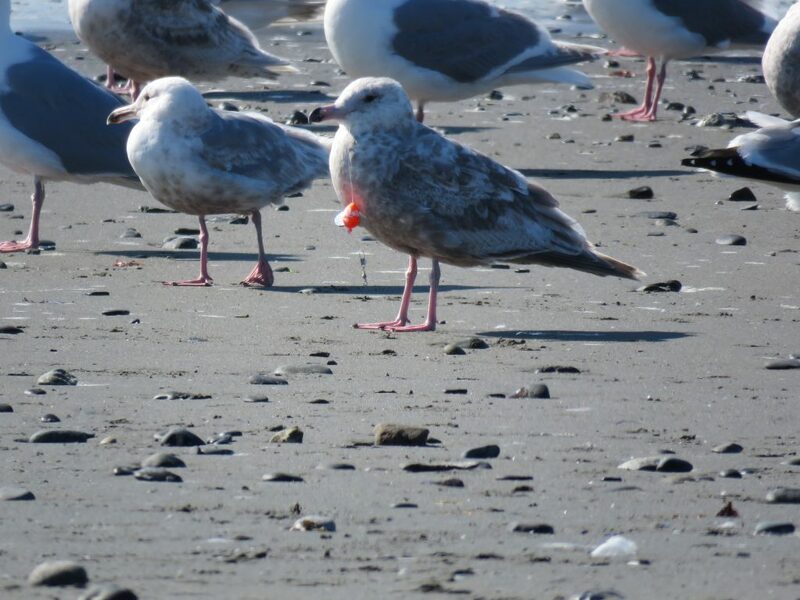 Gulls are often difficult enough to identify, especially before they reach sexual maturity, but added to that is the fact that they often inter-breed and hybridization makes field identification more difficult. Pete Dunne recommends that if you find a gull with “… a mixed array of traits, consider the very possibility that it’s a hybrid” and either try to tease out what the bird is or move on to another gull. This is the one of five North American Gulls that does not have black on its wing-tips. 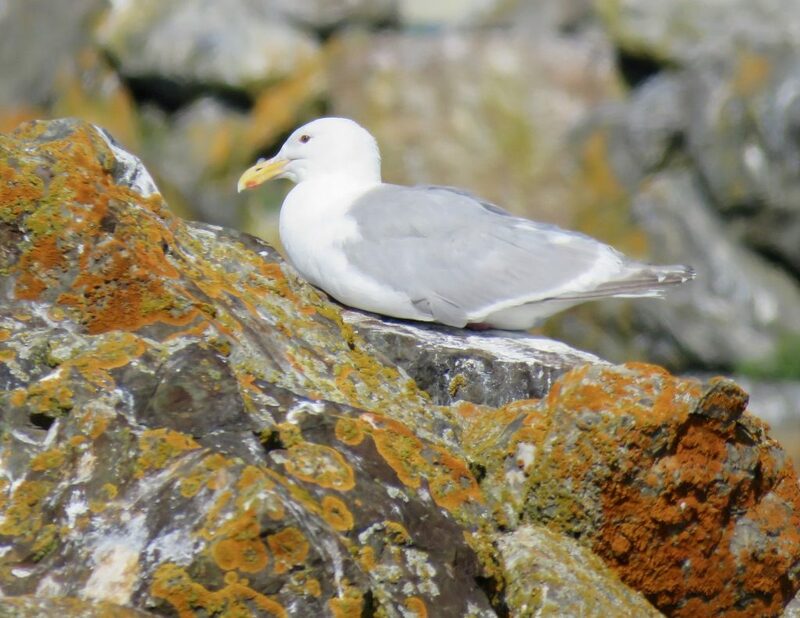 Audubon Alaska has identified the Glaucous-winged Gull species as a common species that is declining or vulnerable, thereby warranting species conservation attention. 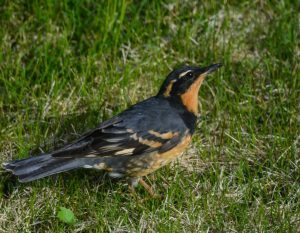 It is estimated that 44% of the bird’s population resides in Alaska making it at-risk for climate change and other environmental influences. The International Union for Conservation of Nature and Natural Resources (IUCN) has identified the population of the Glaucous-winged Gull as increasing, with no genuine threats to the global population estimated at over 570,000 individuals. BirdLife International 2018. Larus glaucescens. The IUCN Red List of Threatened Species 2018: e.T22694334A132543276. http://dx.doi.org/10.2305/IUCN.UK.2018-2.RLTS.T22694334A132543276.en. Downloaded on 10 January 2019. Lucas DeCicco/McCaulay Library/Cornell University Ornithology Lab (ML174609). 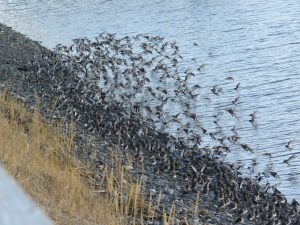 General Information: The Rock Sandpiper is a shorebird that can be found in Cook Inlet, including on the Homer Spit during the winter. 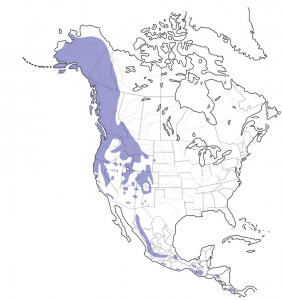 The Rock Sandpiper has a small range – Alaska, Northern Siberia, and west coast of Canada. This bird is a member of the Scolopacidae family and consists of four subspecies. Characteristics: During the winter, this plump, medium-size shorebird is sooty gray in color, with heavily spotted white underparts. The summer plumage resembles the look of a breeding Dunlin, only messier (the black on the chest is smudged, rather than the clean margins of the black found on the Dunlin breast and belly). It has a medium-length black bill with orange at the base, and drooping slightly at the end. The bill is shorter than a Dunlin, longer than a Surfbird. The short legs are a greenish-yellow color, and it has a white wing-stripe( wing bar). Look for a dark tail in flight. The sandpiper weighs in at 2.0-4.6 ounces, and is 7.1-9.4 inches in length. Both sexes have the same plumage – no sexual dimorphism here. 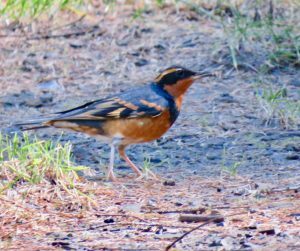 Overall size wise – think American Robin. Preferred Habitat: During the breeding season, the Rock Sandpiper breeds in low-elevation tundra areas, but may also nest at higher elevations in the mountains of western Alaska. Wintering habitat includes rocky coastlines, breakwaters, and mudflats. 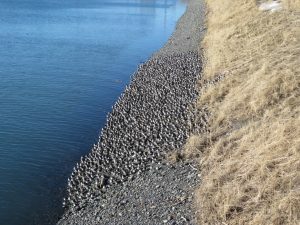 How many Rock Sandpipers can you count in this photo? Breeding Season: The breeding season begins in early June. The Rock Sandpiper is a common breeder in Alaska. Nest: This ground nester scrapes the ground, then lines the depression with grasses, lichens, and leaves. The male begins the scrape, with the female occasionally helping to construct the lining. Eggs and Incubation: Fur eggs are usually laid at daily intervals. Both parents incubate the eggs over approximately 20 days, with the chicks hatching at different intervals. The chicks are born precocial (leaving the nest shortly after bird and feeding on their own). The male tends the young until they fledge. Fledging: The chicks fledge (able to fly) approximately 3 weeks following hatching. Food Preferences: On the breeding grounds, protein is needed and the diet consists primarily of insects, but also crustaceans, mollusks, and marine worms. Supplements include berries, seeds, moss, and algae. In the winter, they utilize tidal areas and eat mostly crustaceans, insects, and small mollusks. Feeding Methodology: In the winter the Rock Sandpiper forages in the intertidal zone (rocky coasts, mudflats, gravel beaches, sand flats, ) where it finds its food visually. Roosting: This sandpiper roosts above the high tide line on piers, beaches, and rocky banks. It can be found roosting along the inner eastern bank of the Homer Boat Harbor during high tide in the winter months. Migration: Spring migration is from late March to early June. Fall migration is from late June to mid-November. Peak fall migration occurs later than other shorebirds. The subspecies of Rock Sandpipers nesting on the Pribilof Islands and in the Aleutians are short-distance migrants or permanent residents. The primary Rock Sandpiper wintering in Homer is a summer resident of the Pribilofs and Aleutians. 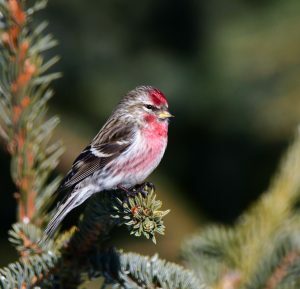 Vocalizations: This bird is generally silent, but listen for low whistled notes sometimes vocalized in the winter. Threats: Change of habitat due to climate change and exposure to predation. 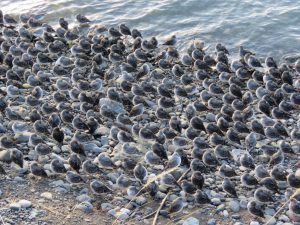 Also, while the Rock Sandpiper can be enjoyed in large numbers roosting at the Homer boat harbor and feeding at the tidal flats, winter is an energy stressor so disturbance from dogs and people is a problem. There are four subspecies of Rock Sandpipers with each subspecies having differing breeding plumage, but mostly look alike during the winter. 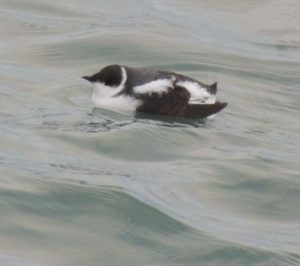 Several subspecies winter in Cook Inlet and Kachemak Bay. 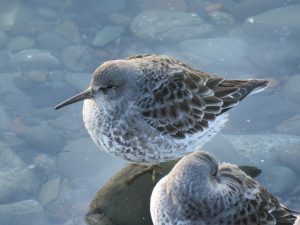 Several thousand wintering Rock Sandpipers can be found roosting, bathing, and preening on the northern half of the eastern bank of the Homer Boat Harbor or seen flying around the Homer Spit and landing on the tidal flats to feed. By late April the majority of the Rock Sandpiper’s have departed Homer for their breeding grounds. 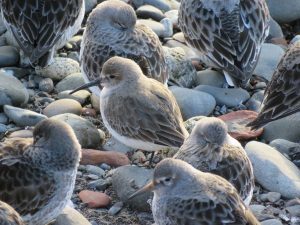 Check your photos and look carefully since small numbers of Dunlin often winter with Rock Sandpipers in Kachemak Bay, and can be confused for Rock Sandpipers (see photo above to see the difference). Like a plover, the Rock Sandpiper may exhibit the broken wing display if a predator threatens the nest. A hardy bird – its wintering area often means ice on feet and legs – no problem for the Rock Sandpiper with its specialized metabolism. Conservation Status: The estimated global population is 160,000-170,000 individuals. 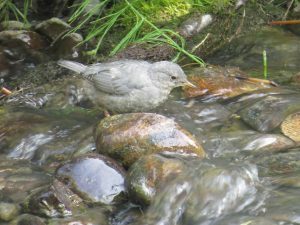 The subspecies C. ptilocnemis ptilocnemis, found in the Pribilof, St. Matthews, and Hall Islands of Alaska are listed on the Alaska Audubon Watchlist 2017 Yellow List – Vulnerable Species. Species on this list are declining or vulnerable thereby warranting special conservation attention. The subspecies population status is estimated at around 20,000 birds. 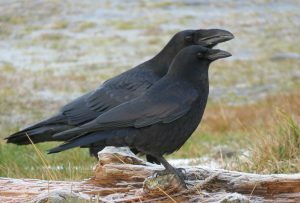 This subspecies primarily winters in Cook Inlet. The International Union of Concerned Scientists have listed (Red List) the Rock Sandpiper as a species of least concern, but with a declining population. 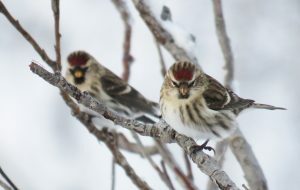 These birds were marked at several sites in western Alaska and are part of a distribution study. BirdLife International. 2016. Calidris ptilocnemis. The IUCN Red List of Threatened Species 2016: e.T22693424A95218793. http://dx.doi.org/10.2305/IUCN.UK.2016-3.RLTS.T22693424A95218793.en. Downloaded on 15 August 2018. Gill, R. E., P. S. Tomkovich, and B. J. McCaffery (2002). Rock Sandpiper (Calidris ptilocnemis), version 2.0. In The Birds of North America (A. F. Poole and F. B. Gill, Editors). Cornell Lab of Ornithology, Ithaca, NY, USA. https://doi.org/10.2173/bna.686. Downloaded on 15 August 2018. Lucas DeCicco//Macaulay Library at the Cornell Lab (ML Audio176399). General Information: Formerly known as Old Squaw, this duck is a circumpolar breeder and a common winter resident in Kachemak Bay off the Homer Spit. 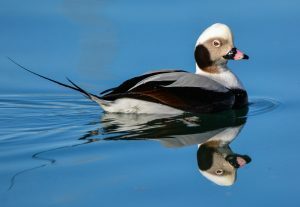 The “old squaw” name was in reference to the bird’s talkative behavior, although it is the male Long-tailed Duck that “talks” the most. 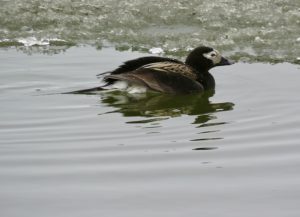 The Long-tailed Duck is a member of the Anatidae family, and the only living member of the genus Clangula. Range: You will have to travel north to find these birds – summer or winter. 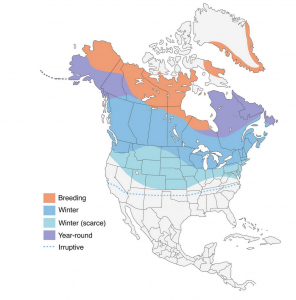 In North America they winter in the northern portions of the eastern U.S., Alaska, and Canada, and breed in the Alaska, northern Canada, and the Soviet Union. 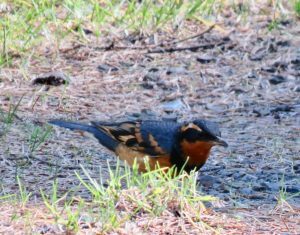 Characteristics/Description: The summer breeding plumage is distinctively different from the winter plumage. 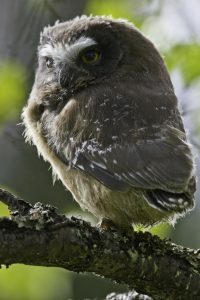 In summer, males have a black head, chest, and wings with a gray face patch that surrounds the eyes. The male’s upper back feathers are long and buffy with black centers. The central tail feather very long (hence their name). The male’s winter plumage, displays a white head and neck, but the gray face patch remains. 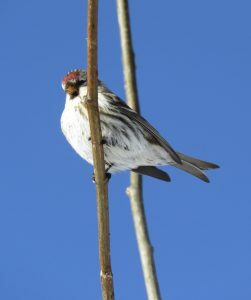 The winter plumage also includes large black spots extending from the side of the check down through the side of the neck. There is a black band across the breast and lower neck. Their lower back is black. The upper back feathers are long and gray. The central tail feather is black. Eyes are a dull yellow-brown. 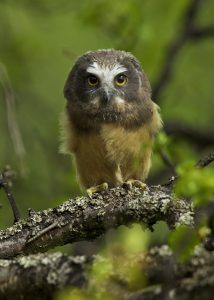 Females in the summer have mostly a dark head and heck, with a white patch around the eyes, extending in a thin line towards the ears. Back and breast are various shades of gray or brown. Eyes are brown. During the winter, their head and neck are white with a round dark brown cheek patch. They have a white belly. Their crown, breast, and back are brownish-gray. Both sexes have uniformly dark under-wings, and small bodies with large heads. 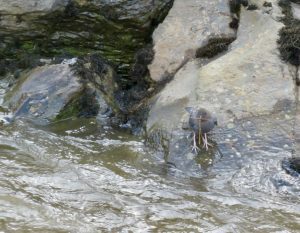 They sit low in the water and are often hidden by the ocean waves. 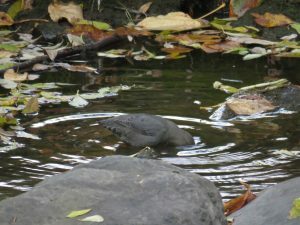 Preferred Habitat: During the breeding season, lakes and ponds are preferred. During the winter, they prefer the open ocean and can also be found on large freshwater lakes. A good spot to find them in Kachemak Bay is off the end of the Homer Spit. Breeding Season: Breeds in the northern Arctic boreal forest and tundra, utilizing open permafrost pools and lake islands. The breeding season begins in late May in the south, to June in the north. They have a single brood. 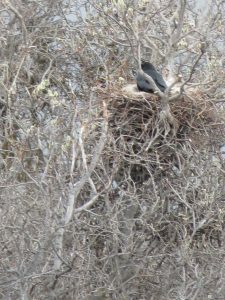 Nest: The nest is a shallow scrape on the ground (often islands or peninsulas), lined with nearby plant material (e.g., willow and/or birch leaves), down, and feathers. 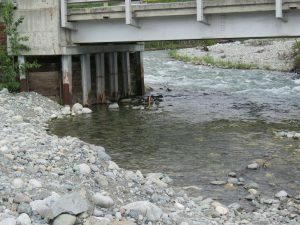 The nests are placed close to the water. These birds are sociable nesters, nesting near other Long-tailed Ducks. Eggs and Incubation: Usually 5-9 eggs constitute a clutch. The female incubates the eggs for 23-25 days. The chicks are born precocial (eyes open) and downy. The young are lead to sea shortly after hatching. They are able to swim, dive, and feed themselves immediately. Fledging: The hatchlings become independent approximately 5 weeks after hatching. Food Preferences: Long-tailed ducks eat aquatic invertebrates – crustaceans (e.g., amphipods and cladocerans), mollusks, fish, and other marine invertebrates. 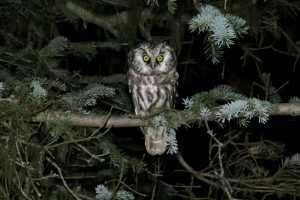 During the breeding season, they will also eat freshwater insects and insect larvae, plant material (algae, grasses, seeds, and fruits of tundra plants). 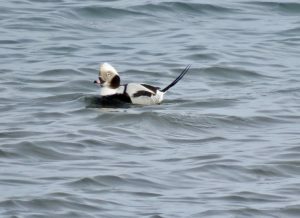 Feeding Methodology: Long-tailed ducks are “diving” ducks. Migration: The Long-tailed Duck migrates from its breeding ground in the far north to its wintering grounds in the not so far north. Spring migration to the breeding grounds begins late February through May, and fall migration to the wintering grounds begins in October continuing through December. The migration is often in groups, and the birds fly low over the water. 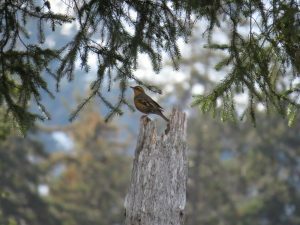 Vocalizations: These birds are active vocalizers all year long. Their call is a three-part yodel. 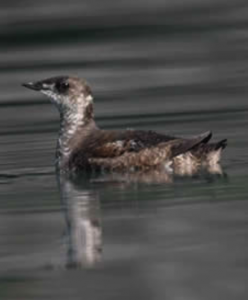 Threats: These birds are “sea” birds and are susceptible to by-catch in gill nets, and oil pollution. This bird can dive 200 feet, although most food is obtained within the first 30 feet of the surface. One of the deepest diving ducks in the world. A diving duck, it spends more time underwater than it does on top of the water. Adults molt three times per year, rather than the typical two times per year of other ducks. And that beautiful plumage we see during the winter? That is actually their breeding plumage (attracting a mate), although the birds actual breed during the spring where their plumage is non-breeding plumage. Confusing right? Conservation Status: The world population is estimated at between 3.2 million and 3.75 million birds. 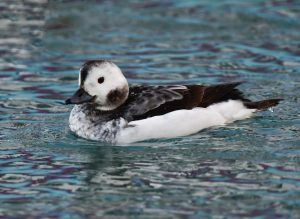 The International Union of Concerned Scientists list the Long-tailed Duck as vulnerable due to the severe wintering population decline in the Baltic Sea between the early 1990s and late 2000. 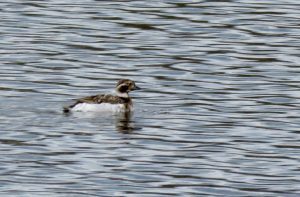 The Alaska Audubon Society has identified the Long-tailed Duck as a species in possible decline on the Yukon-Kuskokwim Delta, although stable on the Alaska Coastal Plain (Audubon Alaska Watchlist 2017: Common Species Suspected to be Declining). 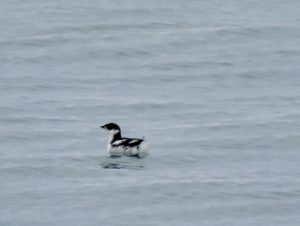 Similar Species: Harlequin Duck, Northern Pintail, Steller’s Eider. Audubon: Guide to North American Birds. 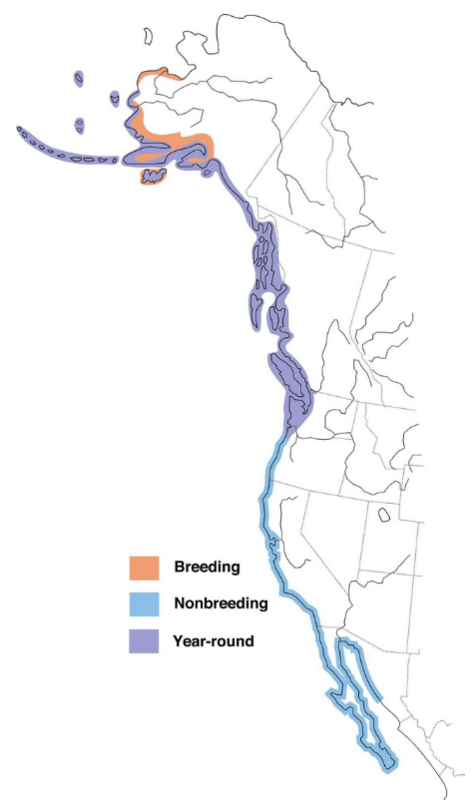 Downloaded on 30 July 2018 at https://www.audubon.org/field-guide/bird/long-tailed-duck. Baicich, Paul J. and Colin J.O. Harrison. 19997. Nests, Eggs, and Nestlings of North American Birds, 2nd Edition. Princeton Field Guides. BirdLife International. 2018. Clangula hyemalis (amended version of 2017 assessment). The IUCN Red List of Threatened Species 2018: e.T22680427A122303234. Downloaded on 29 July 2018. Dunn, Jon L. and Jonathan Alderer, Editors. National Geographic: Field Guide to Birds of North America. 5th Edition, 2nd Printing. 2008. Range: Due to its long distance migration, this bird’s range is quite large. In the spring it migrates from Antarctica to the arctic and subarctic where it breeds. Come fall, it returns to Antarctic either via a western route or an eastern route. Most birds migrate via the eastern route. Characteristics: A medium size tern with angular wings and pointed wingtips. All plumages show pale silvery gray and white primaries (flight feathers) with small dark tips. In breeding, the adult tern sports a black cap, long deeply forked tail, short red bill, and quite short red legs. In non-breeding plumage the legs and bill are black and the forehead white. Preferred Habitat: Open ocean, open tundra, open boreal forests, lakes, ponds, marshes, and small rocky islands. During the winter the terns prefer Antarctic pack ice. 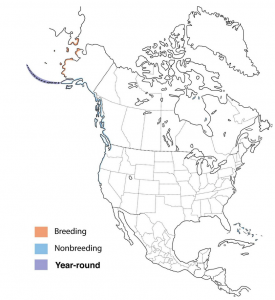 Breeding Season: The Arctic Tern is a circumpolar breeder, with breeding beginning in May and June. Breeding pairs form a monogamous bond during a given breeding season. They do not breed until they are 3-4 years old. Nesting: The Arctic Tern nest in colonies in a variety of habitats: on small, rocky islands – near- shore or off-shore, open tundra, in open boreal forests, and on barrier beaches on the northeastern Atlantic coast. Both the male and female build the nest – a shallow hollow often unlined or sparsely lined with debris and plant material, which is added while sitting on the nest – obtained within reach of the nest. Parents vigorously defend the nest, diving at and striking intruders. Arctic terns breed on Tern Lake (appropriate name) at the junction of the Seward and Sterling Highways. 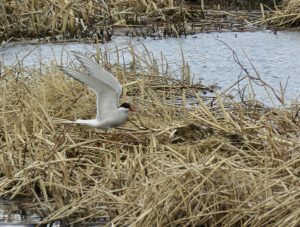 Nesting terns can also be found at Potter Marsh outside of Anchorage. Terns previously nested at the Old Tern Colony on the south-side of the Homer Airport, but disturbance has caused nest abandonment. Eggs and Incubation: Arctic Terns lay between 1-3 eggs, which are incubated by both parents for 21-23 days. Once hatched, the young are tended by both parents. Chicks are semi-precocial (eyes open) and downy. 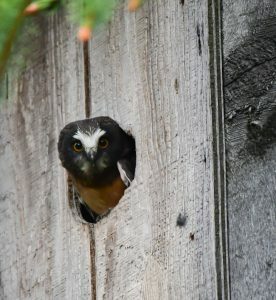 The young may leave the nest shortly after hatching, but they don’t travel far – staying close to the nest. Tern chicks can swim at 2 days. 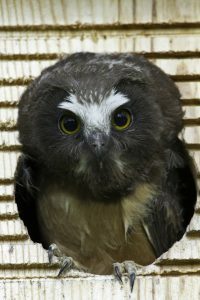 Fledging: The young take wing (fly) 21-28 days after hatching, but are fed by their parents for much longer (1-2 months). These birds will not breed the following year, nor do they make the long migration north. Some may “summer” off the coast of western South America, around Peru. Food Preferences: Arctic Terns feed on small fish, generally less than 6-inches in length (e.g., sandlances, sandeels, herring, cod, and smelt). They may also grab insects from the air or water surface, and are known to eat crustaceans, mollusks, marine worms, earthworms, and on rare occasions berries. While in Antarctica the terns feed on krill. Feeding Methodology: Often feeds with other terns and gulls on the open ocean, but inland generally feeds along tundra lakes, rivers, and marshes. The Arctic Tern feeds by plucking food from the water’s surface or by flying upwind, hovering briefly, then diving to catch prey below the water’s surface. I’m sure we’ve all seen this behavior. The Arctic Tern may also forages over streams, ponds, lakes, marshes, and coastal waters. They are very aggressive toward intruders and may steal food from other birds by swooping at them causing the bird to drops its catch. 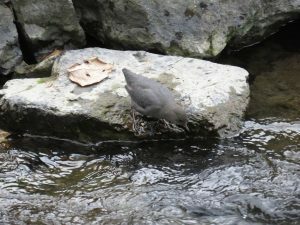 Roosting: Commonly perches on rocks, branches emerging from water, logs, and road signs. Its not uncommon to see an Arctic Tern perched on a road sign along Potter’s Marsh in Anchorage. They can often be found resting on the water. Migration: Arctic Terns are long-distant migrants, traveling an estimated 31,000 miles during migration. 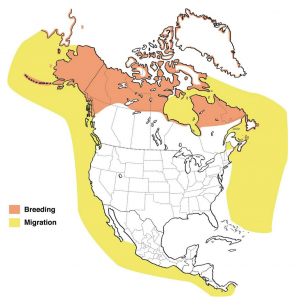 How far and where a migrant travels depends upon what part of North America the bird spends the breeding season. 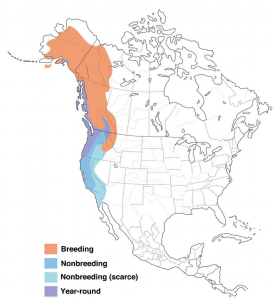 Birds in Western North America (our Alaska birds) migrate south across the Pacific Ocean to Antarctica. Eastern North American birds migrate across the North Atlantic towards Europe and Northern Africa before heading south to Australia, New Zealand, and Antarctica. During migration they remain out to sea. Spring migration is from March to early June. Fall migration is from July to November, peaking August to mid-September. Vocalizations: Foraging or when taking off from the colony, Arctic Terns give a high-pitched “kip” call. Alarm call: A shrill or grating scream high in pitch. Threats: Climate change, oil spills, environmental contaminants, predation (rats, cats, dogs, pigs, horses, cattle, etc. ), human disturbance at colonies, habitat degradation, and reductions in fish stocks. 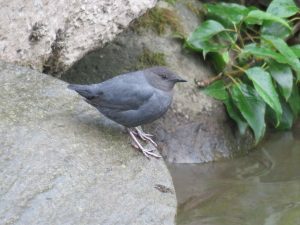 Want to see breeding Arctic Terns then check out Tern Lake at the junction of the Sterling and Seward Highways, with a bonus of possibly seeing an American Dipper at the salmon viewing platform/bridge! Some live up to 25 years, which equals more than 600,000 miles of flying in a lifetime (just think of the frequent flyer miles it earns). They molt their wing feathers during our winter, spending much of that time resting on small ice blocks on the edge of the Antarctic pack ice. 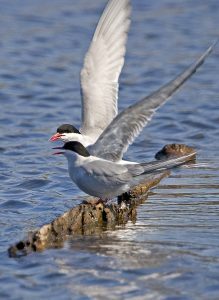 Conservation Status: Alaska Audubon includes the Arctic Tern on its list of Common Species Suspecting to be Declining. 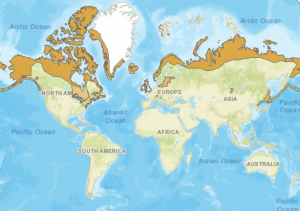 The tern is declining on the Arctic Coastal Plain, but has been increasing on the Yukon Kuskowkim Delta. 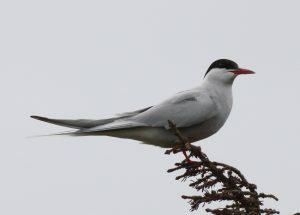 The International Union for Conservation of Nature lists the Arctic Tern as a species of least concern, but noting that the species’ population is declining. Similar Tern Species in Alaska: Aleutian Terns are found in Alaska, and occasionally in Kachemak Bay. National Audubon Society: Guide to Birds of North America. http://www.audubon.org/field-guide/bird/arctic-tern. Downloaded on 3 May 2018. The IUCN Red List of Threatened Species. Version 2017-3. <www.iucnredlist.org>. Downloaded on 03 May 2018.